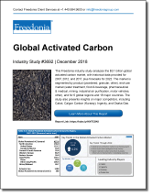 Global demand for activated carbon is expected to increase 4.2% per year through 2022. The Asia/Pacific region will post the fastest increases, supported by attention to air and water quality issues, large sugar production industries, and low-cost, abundant activated carbon feedstocks. Several global regions are expected to post robust growth in the industrial air treatment market through 2022. China will lead the way, with gains fueled by the central government’s decision to tackle air pollution of all types. Authorities have cracked down on sulfur dioxide (SO2) and nitrogen oxides (NOx) and are in the process of updating the country’s coal power fleet to reduce emissions. Such steps are expected to drive activated carbon demand growth in the near term. On the other hand, growth in the US will slow, constrained by a delay in the implementation of the US EPA’s Mercury and Air Toxics Standards. In addition, the US – along with a number of other developed countries – are reducing their reliance on coal. This will limit new opportunities for activated carbon suppliers in both the near and long term. As a result of air treatment market growth, powdered activated carbon will see faster growth than granular types. In addition to its uses as one of the more effective air pollution control technologies, powdered activated carbon will also post strong gains in liquid phase applications through 2022. In developing markets, this product type is favored due to its low cost, ease of use, and ease of disposal. While water treatment is a mature market in many countries around the globe, numerous other areas (like India and much of South America) still lack regular access to clean water. Yet more (such as South Africa) are facing water scarcity, while still others (like much of Eastern Europe) confront the legacy of industrial pollution. China has made efforts to improve its wastewater quality in recent years through its 13th Five Year Plan. For most nations, however, water quality improvement will come at a slow and steady pace as infrastructure is expanded. In 2017, Ingevity completed an expansion of its Georgia, US activated carbon honeycomb plant. In August 2018, the company announced plans to increase capacity for extruded pellets at its Virginia, US plant. Ingevity’s primary focus is the motor vehicle market, and the company expects healthy growth for high-value activated carbon types in this segment. US phase-in of its ULEV II standards and China’s increasingly stringent air quality standards will support dollar gains in these countries.